Destined to become a classic in the tradition of the best-selling Black-Eyed Susans/Midnight Birds and Erotique Noire/ Black Erotica. Afrekete gives collective voice to the tradition of black lesbian writing. In the vast and proliferating area of both African-American and lesbian and gay writing, the work of black lesbians is most often excluded or relegated to the margins. Afrekete meshes these seemingly disparate traditions and celebrates black lesbian experiences in all their variety and depth. Elegant, timely, provocative, and inspiring, the fiction, poetry, and nonfiction in Afrekete -- written in a range of styles -- engage a variety of highly topical themes, placing them at the center of literary and social discourse. Beginning with "Tar Beach," an excerpt from Audre Lorde's celebrated memoir Zami: A New Spelling of My Name, which introduces the character Afrekete, the collection also includes such prominent writers as Michelle Cliff, Carolivia Herron, Jewelle Gomez, and Alexis De Veaux. Other pieces are by Jacqueline Woodson, Sapphire, Essence editor Linda Villarosa, and filmmaker Michelle Parkerson, with other contributions by exciting new writers Cynthia Bond, Jocelyn Taylor, Jamika Ajalon, and Sharee Nash. 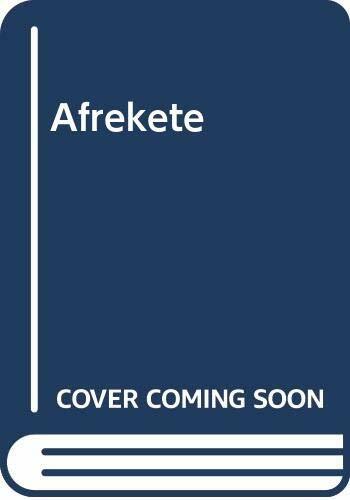 Afrekete is a collection whose time has come. It is an extraordinary work, one of lasting value for all lovers of literature. A fresh, engaging journey, Afrekete will both inform and delight. Catherine E. McKinley is a graduate of Sarah Lawrence College, where she and L. Joyce DeLaney began their creative collaborations. She is a writer whose work has appeared in Black Women in America: An Historical Encyclopedia and various magazines and journals. including Essence, Emerge, and Ms. She lives in Brooklyn, New York. L. Joyce DeLaney is a screenwriter and independent videomaker. She lives in Los Angeles. The title of this collection of 20 essays, stories and poems is the name of a lover portrayed by Audre Lorde both in the excerpt from Zami that introduces the collection and in the poem that ends it. Both are, first and foremost, works of literature. As the editors say in their introduction, "identity politics bind and frankly bore us," and here beauty, meaning and insight outweigh any given political stance. Even where there is politically charged jargon, such as in Jocelyn Maria Taylor's essay recalling her life as a stripper and her burgeoning political consciousness, it is compensated for by her smart take on the image of the black woman's body. By and large, the selections are encompassing: any African American will understand Alexis De Veaux's painful letter to her light-skinned "Dear Aunt Nanadine"; any woman will cringe at the story of a back-alley abortion related by Helen Elaine Lee. And any human will be moved by Cynthia Bond's searing tale of abuse and madness. The essays are intelligent, for example Jewelle Gomez's look at her complicated relationships with black men; Linda Villarosa's studied response to blinkered Bible-thumpers who would throw stones; and Evelyn C. White's touching, nostalgic recollection of family life in Gary, Ind., in the '60s and her first realization that her mother was a woman, not just an accessory to child and man. Not every piece is of equal quality, but the majority deserve to be read. 4. Afrekete McKinley, Catherine E.